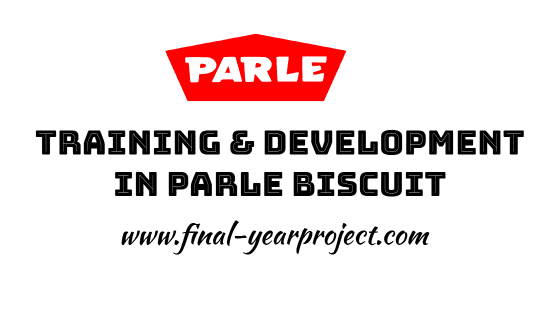 This is MBA project report on "training and development in Parle Biscuit Private Limited". The objective of this management project is to know the effectiveness of training and development. Firstly, this project discuss about the training and development i.e. what is training and development, types, methods and approach, etc. Secondly, it tells about the company profile of Parle Biscuit Private limited. The analysis have been done through the process of filling the questionnaire, to know exactly what the employees feels about the company training and development programs. You can also Subscribe to FINAL YEAR PROJECT'S by Email for more such projects and seminar. Training refers to the acquisition of knowledge, skills, and attitudes as a result of the training of vocational or practical skills and knowledge that relates to specific useful skills. Training & development is the field concerned with workplace learning to improve performance. The principal objectives of training and development divisions is to make sure the availability of a skilled and willing workforce to an organization. In addition to that, there are four other objectives: Individual, organizational, Functional, and Societal. In Parle Biscuit Private Ltd. training & development activities assumes a significant place. The management is deeply interested in developing their people through this tool in effective manner. All training & development activities are quite exhaustive in nature and are carefully woven exercises. Utmost care is taken to make this process effective. 1. To understand and appreciate the training system in an organizational context. 2. To understand the existing training method in the organization. 3. To take the feedback from the employees on the training programme. 4. To find the problem if any the system. 5. To suggest the method if any improvement is needed. 6. To gather information on training needs and identification. 7. To study the process of training in the Parle Biscuit Private Limited. Training and development programmes in Parle are relevant and effective in preparing the employees for the job they do as well as keeping them appraise with new technology in this competitive era. Training facilities were perceived by the respondents to be quite adequate. The training was relevant and effective in terms of the job performed by the managers. Training and development programmes undergone by the management staff improve performance and effectiveness of employees.